Most trails in Landmark/Boston Lot are now open. The two exceptions are Rt10 and White Light, which will probably be open by the weekend. As for other trails around the area we hear that most of the Hartford Town Forest trails are dry. STAB has opened the Ascutney trails with just a few closed off for a while longer. 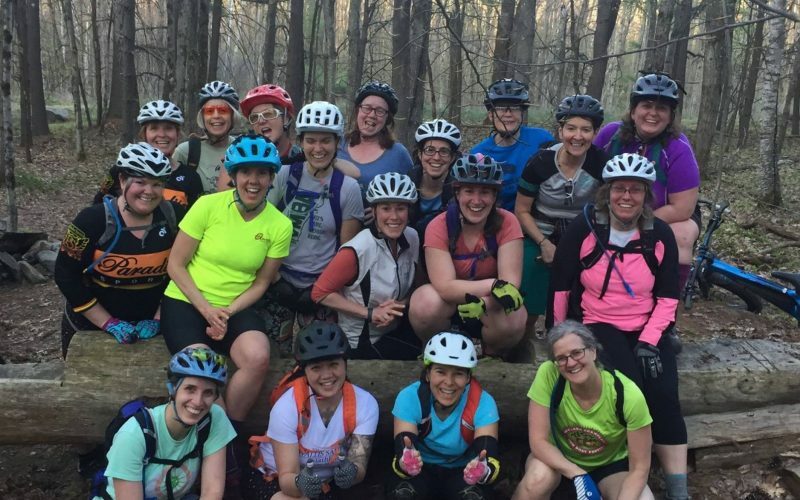 Group ride season kicked off on Monday with the first Monday Night Ladies Social Ride, attended by 18 riders! They’ll be hosting a new ride each Monday, next week it’s at HTF led by Anna. There’s a bunch of group rides and events coming up, stay up to date by checking out our calendar. If you have MTB related events coming up in the area drop us an email. Have you loaded up our Landmark/Blot map on your smartphone yet? Visit the Lebanon trail page and look for the map link on that page. It’s a great way to see where you are at while on the trails. Also there’s a little warning sign “!” in the lower left corner for reporting trail issues. Tap that if you find a downed tree, trail damage, or other issues, type in a short descriptions and send it to us. Finally a reminder that Spring Work Day is coming up Sunday May 20th at 9am. Head over to the calendar event for it and register so we can get an idea of how many to expect. We usually get a great turn out of bikers, runners, hikers … including families with kids! Plenty of work for all skill levels to help whip the trails into shape for another season.